ATM is an E- banking machine which performs financial transactions without the help of a Bank Employee. 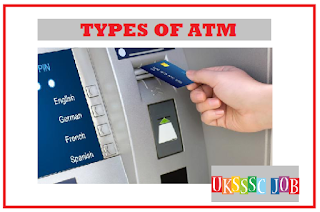 According to Money and Maintenance ATMs are classified in 3 Types. Bank Owned ATMs- The ATMs which are owned,managed and installed by banks. The most common , U see the bank branch building. Brown Label ATMs- Brown label ATMs are little different from bank ATMs. They R outsourced , to a company who manages, installs and look after the ATMs. These ATMs has the Logo of the bank in it,which makes sure that ATM is installed by the bank. Mostly these were used by Private sector banks in india. Some of the high-tech Brown Label ATMs swallows the card till the transactions over. You can check them out in metro cities under various famous banks like Standard chattered,HDFC,ICICI Bank,Yes Bank. White Label ATMs are similar to Brown Label ATMs except the fact, they don't have any Bank Logo in them. These are maintained by NBFCs. RBI has given license to Non bank entities to open such ATMs. Any non bank entity with a minimum Net worth of rs. 100 crore can apply 4 White Label ATMs. Tata Communications Payment Solutions Limited (TCPSL) is the first company authorized by RBI to open White Label ATMs in the country. Other White Label - Muthoot Finance , Srei infra , Vakrangee Software , Prizm payments.